Professor Metteus ended his class every day with the exact same words. They didn’t seem to be a quotation, or even have some deep meaning. Certainly the man never explained the words or why he said them every day. Every day, just like this one, he would lean against the front of the desk, stare ahead into the class, and wait. He would almost expect an answer to a question that he never said. Why he expected an answer was beyond the knowledge of the class. Professor Metteus was one of the teachers you certainly listened to, but actually talking never really seemed to be an option. He wasn’t loud, boisterous, he truly wasn’t anything. Except spindly. He had to hobble about on a cane, and his hands most often shook whenever handing back a paper or test. A stick figure would have more definition than Professor Metteus. After a few moments of silence, Professor Metteus bowed his head, and returned to his seat. He settled into the armchair, picked up a pen, and stared at the wooden furniture. “Maybe next time,” He whispered under his breath. “Have a wonderful day,” He said to the class as they filed out. The professor closed his eyes, and turned off the world for a moment. One student remained in his seat, and pondered his choices. Brian wanted to answer the question. Truly. If nothing else, it seemed important. Not just to Metteus, but to him. He wanted to know what kind of story needed a spark. Or maybe if it was the one he was looking for. Brian scuffed the floor with his shoes. Come on, he whispered o himself. This isn’t high school, this is college, dammit. He didn’t mean to, but Brian couldn’t think straight. This wasn’t what he was studying classics for. The boy in him remembered good tales, grew up with them. Professor Metteus shook his head, and clenched his eyes shut. “I want the boy’s adventures to come back!” Brian shouted. The corner of Metteus’ mouth twitched. If it was a smile, he didn’t allow it to grow any further. “They aren’t any good.” Any good, Brian was sounding like a kid. And why not? The world treated students as such, and they thought of themselves that way. To be honest, this student thought of himself as a child. And children do not respect the social niceties, so onward and forward! “Because a certain ending is for matters of science and the classroom.” Brian could almost see his thought running out of his head. In the classroom, X=X, 2+2=4, etc. There was a logical conclusion given a set of facts and situations, which could be easily predicted. Not so with a story. Even if 4 is the logical conclusion, it would never be something so simple as two and two put together. Because two and two would be twenty-two, divided by fire and squared by the root of all evil. That is how a story finds its way to and fro, or to two and four. Had Brian said that aloud? He couldn’t remember. Did it matter? Where was he? Brian could only nod. He must be dreaming. “We have the beginnings of a good story, with a good ending,” Metteus yelled. The darkness was joined by a howling wind that tore into their clothes. Metteus’ jacket whipped open, revealing a blood-red shirt underneath. Brian huddled within himself and tried to consider what was happening. “Once upon a time,” Metteus muttered. “A time that was now, and will be again. We may not know how, but we will be then.” He was so stunned that he must be speaking in simple rhymes. Brian looked around himself. Professor Metteus was gone. There was nothing, only black. Wind howled out of nowhere. Describe him? Well, he has a young face. Stop saying young. A voice echoed through the black. Young is nothing more than an age of foolishness. No, the boy has a youthful face. Look there, as he glances from one spot to a next. He takes everything in. The smallest smile is on his face, almost wanting permission to grow. A mess of hair, the color of sand on straw, is plastered on his head. Sweat-soaked and panting from running to his favorite spot. Peeking out of the hair are freckles, stretching from cheek to cheek across a rounded nose. Strange, Brian always had freckles as a kid. He jumps onto a rock. Short, thin. That boy could probably have a better time scrambling up the rock if he dropped that stick of his. But it is his favorite, just the right heft and length. Two-thirds the length of his arm, and as wide around as a baseball bat, he could tell all sorts of stories about that stick. And get in trouble with no end of people. That is a young boy. Is it good? No, because good is not a concept yet. Good is done, because what else is there? He jokes, I run through the woods. What are you wearing? I’m wearing my favorite blue shirt. Blue? Not red? Red is okay, and has its place. But blue is for boys. Blue shirt, ragged at the elbows, and brown pants that are green at the knees. “My name is Bree,” The boy whispered. He looked around, and light started to poke out of the black. He frowned, and scratched that sandy straw hair out of his eyes. He was confused. Was he Brian, or Bree? After a moment, he probably thought he was both, though it was Bree’s turn to play. Professor Metteus’ body was gone. He didn’t seem to be, Bree could almost feel him pressing on the background. The professor lay just behind the scenes, waiting to be recognized. Where was Bree? He was in the forest of Anworth, of course! This was his second home. Look to the east, and the sun is rising up over the mountain valley on the trees. The firs mixed with the oaks and maples. If he turned just so, Bree could feel the air. Ah, that smell. The firs mixed in with brine from the sea, swirling through the mountain valley. Bree could stay here forever. Any people? Of course there were people. Go over the northern mountain, and you would come to the village of Greenshere. The most peaceful den of villains to be found in all the lands. Proper villains, that only attacked either during daytime, or right after dinner so as to not ruin a meal. Any other time and they were more than willing to give directions to their favorite fishing spots or a fruit tree that just recently ripened. Bree could hear a laughter crackle next to him. It seems a perfect danger. It was. Everything a boy could ask for. Bandits, cutthroats, even pirates. Though the goblins were a trouble. Did Bree think goblins? Where did the goblins come from? There they were, peeking out from behind that fallen oak tree. Bree counted five as they emerged. They were a mottled green, with squat heads on spindled bodies. They held onto their daggers for dear life, almost thrust out ahead of them in surrender. As they recognized that this was a boy, the goblins stopped. They smiled, and relaxed. Perhaps an adventurer was too much for them, but a boy might be a different matter. Bree held his stick forward, and glared straight ahead. He was the hero, he’s got this. He’s also apparently twelve and couldn’t remember anything about combat other than running and hiding. You should probably do that. That sounded like a wonderful idea. Bree turned and ran towards the mountains. The boy could hear the goblins behind him. Keep running, just keep running. Bree fell into the boy’s memories. His footsteps became more familiar, more practiced. He had run over these woods every day of his life. Every night to boot. He could do this. It fell into one of his games. Up over the flat-top rock. Slide underneath the fallen tree. He laughed when he heard the thud of one of the goblins hitting its head underneath the tree. They had to go under just right, or it wouldn’t be pleasant. A dagger whistled past his ear, and buried itself in the tree next to him. He skidded to a stop, and raised his hand to his cheek. When he pulled his fingers back they were spotted with blood. Careful. He could hear Professor Metteus chiding him. This is quite real. And like you said, the danger has to be real. Oh, no. It was getting harder to breathe, to see. It couldn’t be real, this wasn’t real, it was just supposed to be a game, a story. Bree tripped over a tree root. He went sprawling, head over heels into the earth. No, no, the goblins would get him. They’d tear him apart. They’d…focus. What do you need? Bree needed help. He needed a friend right now. Like Kelly, she was always there to keep him out of a scrape. She would know what to do now. Something tapped Bree on the top of his head. He looked up, and tried not to stare. A rope dangled in front of his face. Bree grasped the rope, and Kelly jumped out of the tree. The goblins broke through the trees as Bree sailed up to the branches above. Bree looked on as Kelly…no, Keira, threw herself at the five goblins. Armed with a curved short sword, it danced against the clumsy dagger strikes. The finer steel clanged against the iron. One of the daggers shattered in its master’s grasp, leaving the goblin with only a hilt and a hope. That was Keira. Funny, daring Keira. Her hair today was like black fire, jutting up in flames kept close to her scalp. Her golden eyes glinted against her auburn skin. Even in the heat of battle, there was a grin on her face. Bree caught himself staring. But how could he not? Keira was wearing one of her favorite outfits. Black pants, and a leather tunic that left her arms bare to the shoulder. For movement, and because she liked the salt air on her skin. Bree didn’t complain. Is this a love story? No! No, this was an adventure. Keira was a friend, a mate. Not that kind. Bree was blushing, he hoped Keira couldn’t see. “Quit staring like an idiot and get down here!” Keira shouted up at him. “I’m enjoying the fun, but some help could…oh, dang it!” She parried a dagger, spun the sword in her grip, and punched at a goblin that got too close. Bree jumped out of the tree. Keira pushed a goblin towards him, and Bree landed on the monster’s head. The two crumbled to the ground, and Bree emerged victorious. He thrust out with his staff, catching a goblin in the back before it got too close to Keira. It yelped, and fell. Keira slammed her foot down on the beast’s head. The two spun back to back, ready to meet any other foe. But the goblins had had enough, and melted into the forest. Bree shrugged, and kept trying to find a reason to blink. Keira was quite a few inches taller than him, and since she turned fifteen she was developing some interesting…mate! Wrong word, no, that was the wrong word. Friend, buddy, pal, platonic. Besides, she was fifteen. Best to put it out of his head, and focus on the fun things. Like…what were they going to do again? Right! The titan’s lair. Bree saw it now. A giant had plagued the villages around Greenshere for weeks now. A terrible thing that had torn through the countryside with reckless abandon. Its lair was found settled in the southern mountains. And they were supposed to get to it this evening, how could he have forgotten? Nor could he forget the giant’s master. Prometheus, the crazed Titan. He sat above the giant’s castle, pulling the strings from above. Prometheus would not be denied. We don’t know? How could they possibly not know how to beat the giant? That was the end of that. The boy Bree started asking questions, every sort of question. Can the giant be felled by mortal weapons? Keira didn’t know. How about a mortal weakness? Not a clue. What kind of minions did the creature have? The girl was within seconds of smacking Bree over the head. He’d wait for a few seconds. Ponder whether or not now was a good time to ask another question. Bree would decide against it, wait again, and then ask the question. Keira flipped between answering with an “I don’t know,” or chasing Bree up a nearby fir. Soon enough the sun started to dip from the sky. “We have no clue about what we’re doing,” Bree commented. That seemed dangerously close to one of his annoying questions. Bree shifted his weight towards an oak tree, to avoid so many needles. Instead, Keira’s shoulders slumped. “I know that,” Bree scuffed his shoe. He wasn’t stupid. And yet here he was, fighting a giant of Prometheus’, with no clue of how to beat it. But on they went. Towards the castle lair. Bree led, past the trees and comforts of Anworth forest. You are making a wonderful mistake. A mistake? Perhaps, perhaps it was at that. Bree knew that he might be risking his life. Certainly the tales told in Greenshere about any who ventured near the Chained One never ended happily. But the giant had stood up to the best the lands had to offer. Bree was willing to ask for help. He and Keira came into view, clearing a last copse of trees, and hung back. The chains lay before them. Iron links, each as big around as Bree’s torso. They were bound together, and driven into the rocks by iron spikes. Four such chains were clasped to enormous wrists and ankles, and there he was. The Chained One. The Chained One, you may ask? For he was known, certainly. Bree and Keira could tell all the tales of him. He had broken the rules, defied authority. For this he had been chained to the rocks, forced to live out eternity in agony. He was twenty feet tall, strapped to the side of the mountain. He was naked save for a cloth garment covering his waist to his knees. His arms and legs struggled and writhed against the stone. It was unclear which would break first. His chest was that of an Adonis, finely chiseled against the granite behind him – save for the gaping wound in his abdomen. It bled freely, and continued to do so as Keira and Bree considered their next move. As for his face, he looked…he looked like professor Metteus. The eyes were the same shade of green oak leaf, the curled hair was just as rich. But there the sameness ended. The hair was plastered to the Chained One’s face where Metteus would have it meticulous. And his eyes darted about the landscape, bloodshot and teary. He could not fixate upon a single object for longer than a glance. Discovered, Keira and Bree picked their way towards the behemoth. They stayed on one side of the chains, just out of reach. The two remained silent, and stared at the man. “You deserve it!” Keira shouted. She gasped, and clasped her hand to her mouth before it could speak again. “I saved humanity!” The titan thundered. Bree had a passing thought. A memory from another self, floating through the ether. He reached up, caught it, and let it go. Keira turned around. She stood, and shifted on her toes. She balanced on one leg, and then the other. She scrunched her eyes tight, then opened them as wide as possible before breathing. She turned back around. “So you say…” She began. This was not right. Prometheus was not the Chained One. He was the hidden master, the ruler of monsters. Crouching from on high, ready to do…something. That last part was always glossed over. They did remember. The tale was old, older than Greenshere itself, but it was real. A tale of gods, wrapped up in petty squabbles and vanity. Divine beings that took away fire rather than share it with humans who had to scratch their way through the dirt. The world grew cold, and dark, and bleak. Humans huddled together for warmth, and still died out slowly. Then the titan Prometheus stole fire from its hiding place. With honeyed words and guile he slipped past the defenses of the gods. He hid fire within a hollowed stick, and bestowed it to humanity. For his insolence the gods bound him in iron, strung him upon a rock, and set a bird to tear into his flesh and devour his liver. His wound would heal every day so that he could be tormented again the next morning. This was Prometheus’ punishment for aiding man. Keira and Bree could feel the fog of memory fade as the true tale settled in their minds. It seemed ridiculous to even consider the false tale had once prevailed as factual. Keira slammed her sword against the chains. Iron was met with steel, and the steel clanged away without leaving a dent. “Save your strength, woman,” Prometheus said. “From the giant,” Keira swung her sword against the chain again. The blade rang out again, and Keira almost dropped it. That clang, it knocked a memory loose! The giant did not protect Prometheus, but rather kept him in chains. That had to be stopped! The giant’s minions! The ghouls, the goblins. The snargles and rasks that shuddered out of the hills in the waning light to find the two children who dared trespass on their mountain. Nightmares stampeded before them, whinnying with dreams and terrors in their wake. Be clever. Be clever. Bree beat the stick against the chains a few times. No, that was stupid, come on! 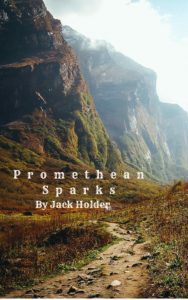 Think about what freeing Prometheus would truly mean. He is a titan, a being of enormity and wondrous feats. Shaking a material at his confinement would do little. It must be something more, something elemental. The boy’s eyes widened. He set the stick next to the iron. Picking up two links, he scraped the rusted metal together. It screeched in Bree’s ears, promising more pain if he held on. Bree instead redoubled his efforts, and kept rubbing the metal. A spark flew off the chain, landing with malice on his foot. Bree grimaced, and held on. Keira spun around, holding on to her sword for dear life. Were she to drop it for an instant, or stop and glance back at her friend, she surely would be dashed to pieces. She trusted in him, and continued on. Bree smashed the links together, and a rush of flashes spurted out towards the ground. The grass blackened and singed, and the stick started to smoke. Once more, Bree. Strike the chain once more, and let the strike be true. He slammed the chain against itself. Iron shards blew apart, fire lighting on the stick and setting it ablaze. Bree snatched up the torch, and held it aloft towards the titan. The giant appeared. The giant had come! A bulbous creature, hulked over its bulging torso. It shambled forth, stumbling over its own creatures. It snarled and drooled, snapping at those who got in its way. It pointed a long, diseased claw at the children, before looking away towards some unseen enemy. The giant let out a lowing cry, and charged. Prometheus strained once, and grasped the torch by the flame. It flared once, and almost seemed to catch and grow in his grip. If the fire scorched his flesh, he did not give a sound. He adjusted his grip, and thrust the blaze into his chains. The iron gave a screech of protest, before all four burst apart. He landed to the turf. His wound had healed, disappeared. Prometheus held the torch high, and glared straight ahead. He held his focus on the giant, and his face was contorted in full fury. Prometheus stared at the giant. It had slowed, and howled once. Prometheus’ eyes narrowed, and he pointed his torch at the beast. Prometheus thrust the torch forward. It flared greater, brighter than the sun. The torch was white now. White light that burned Bree’s eyes. He held them shut in his hands, and still white bled through. There was nothing but white. There was never anything but white. White light is all colors, blended together in a rush of truth too blinding to behold. Bree couldn’t see. He couldn’t hear. He couldn’t breathe. Professor Metteus frowned. He leaned against the desk, his cane all but forgotten in the desk chair. His fingers tapped against the hardwood, almost waiting for a different ending. Kelly was seated next to the door. She had completely forgotten when she had entered. It had been important at the time, almost urgent to get Brian’s attention. Now she had to blink and remind herself what her name was, let alone where this body was rooted to. Brian for his part was standing on a chair. His arms stretched wide in accepting the glory of the light, head thrust back and eyes closed. This was life, this was truth. There was an ultimate, and he had found it. Brian opened an eye. He raised a foot, and looked at it. Perhaps it had changed during his story. Had it, and he hadn’t noticed? And changed back? He didn’t know if he could trust his foot. The young man set his foot on the floor, and leaned on it. The appendage didn’t give way. Perhaps it was okay to trust it. For now. “What does Prometheus want to do?” Kelly asked. Kelly and Brian glanced at each other. “For some reason, Professor Metteus left his cane,” Kelly said. The two looked at each other, then bolted for the door. They looked down each hallway, straining to catch a glimpse of a tweed jacket or a spindly titan. Instead, all they could gather was a smell of smoke in the air. When they returned to the room the cane was still there. Brian picked it up, and almost dropped the wood. It was still hot, scorched black at the handle. Soot covered Brian’s hand. He didn’t know whether to stare at the cane or his hand. Kelly walked next to Brian as they left the school. The day was still bright, the sun just beginning its dip towards the ground. Around them the trees rustled an invitation, while the road beckoned to be walked.